Machine Learning algorithms are being developed and improved at an incredible rate, but are not necessarily getting more accessible to the broader community. 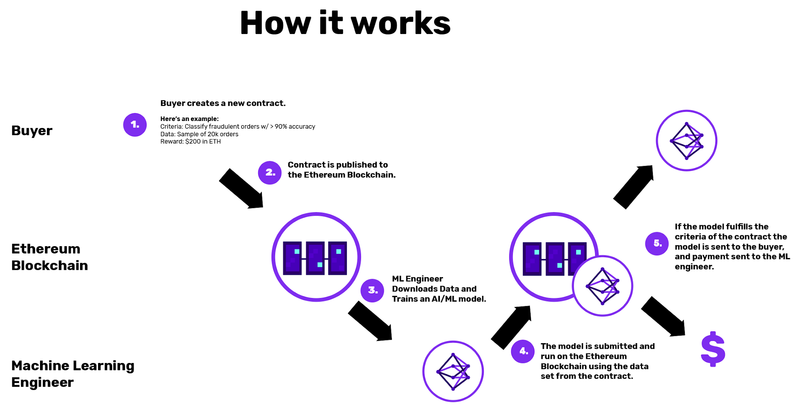 That's why today Algorithmia is announcing DanKu, a new blockchain-based protocol for evaluating and purchasing ML models on a public blockchain such as Ethereum. 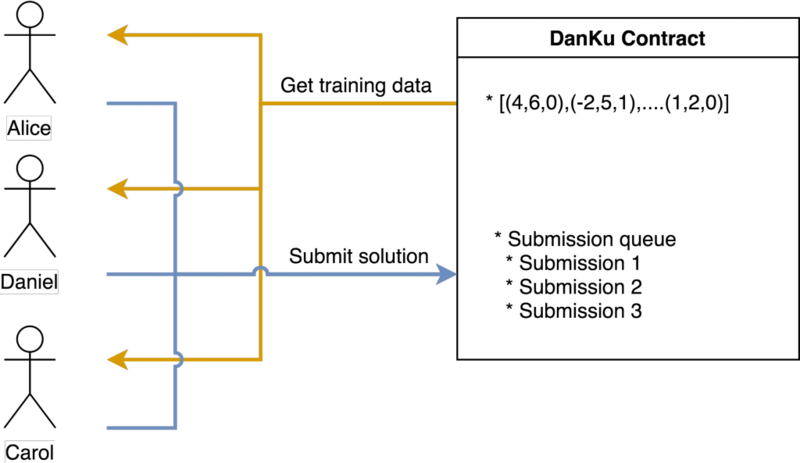 DanKu enables anyone to get access to high quality, objectively measured machine learning models. At Algorithmia, we believe that widespread access to algorithms and deployment solutions is going to be a fundamental building block of a balanced future for AI, and DanKu is a step towards that vision. We're also launching the first DanKu competition for a machine learning problem. For more info, please refer to the last section regarding the competition below. As of 2018, Artificial Intelligence and Blockchain continue to dominate tech news everywhere. Earlier in 2017, we asked ourselves if we could brings these two things together and solve a problem in Machine Learning. As with most ideas, we noticed that we weren't the first group of people who played around with the idea of using blockchain and ML together. And voila! Bob and other participants just exchanged ML models in a completely trustless manner. The contract also ran a fully functional ML model on the blockchain too! Isn't that neat! 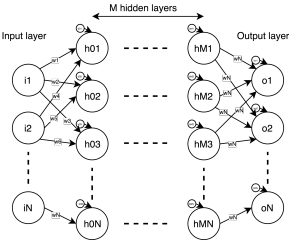 Initially, we started with something simple: A linear model. After gaining a bit of confidence, we tackled the problem of implementing a neural network from scratch. We initially started with a neural network with no hidden layers. 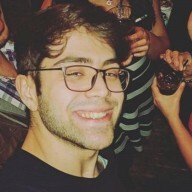 After getting that working, we focused on allowing submitters to define any simple network architecture, and it would work if it wasn't too computationally expensive. It's also likely that DanKu contracts will create opportunities for GPU miner arbitrage. GPU mining farms/pools will likely switch to ML training if it's more profitable. These pools will probably be managed by Data Scientists, who will try to solve these ML problems. The contract reward could later be divided among the data scientist and GPU suppliers. Another interesting application would be in finance. If submitted models result in a tangible financial result, it would be a lot easier to create DanKu contracts and finance them. This would also create a well defined price for DanKu contracts, since it's a lot easier to assess the value of these types of predictive models. DanKu contracts also create the opportunity for AI systems to self-improve. AI systems could contract out work to improve itself in an automated and seamless manner when it encounters new data. The use of cryptocurrencies also makes it an attractive method of self-improvement, since crypto payments and transactions are accessible by anyone (or anything). It's just another API endpoint. It's hard to tell what will be next on the roadmap, but there's still a lot of room for improvement. Improvements in Ethereum, further optimizations in the contract, and improved protocol design can all make DanKu contracts better. With these improvements, a more diverse set of ML models could be further supported. 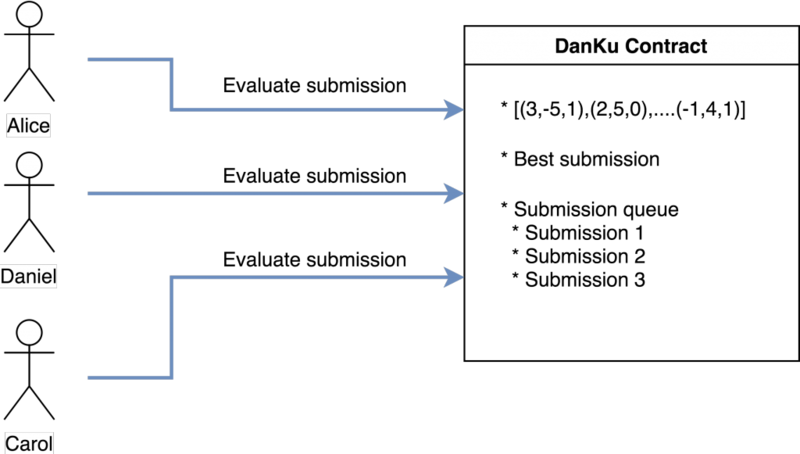 Since we've just announced the protocol, we thought that it would be also fitting to create the first public DanKu contract. For this competition, we've decided to use the 2016 U.S Presidential county election data as our dataset. 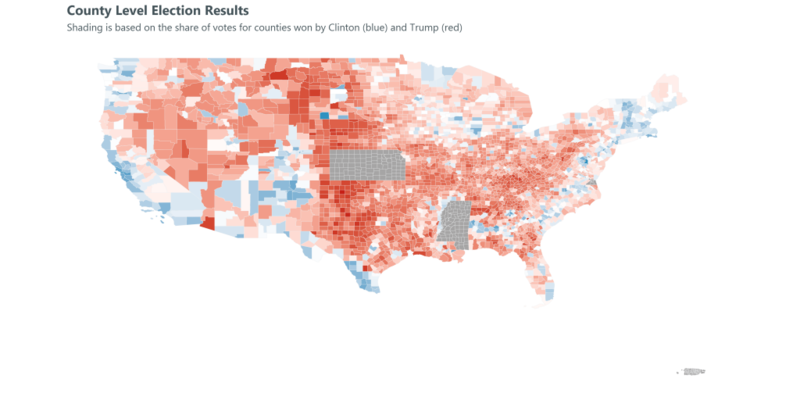 Every county is represented with 3 data points: longitude, latitude and elected candidate. You can find the guide here to help you participate in the competition. After the competition ends, we'll deploy the winning model to the Algorithmia marketplace!